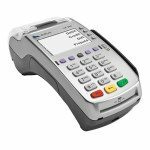 Verifone Vx 520 EMV and NFC (Contactless) credit card terminal. Plug it back in, and allow the terminal to reboot. Go back to the soft pay screen, and then they select the sales screen. If that doesn’t fix the problem, then go ahead and call technical support or open a ticket with us. More information is available on setting up your Verifone Vx 520 credit card terminal.